Stephen Glassborow is a sculptor who presents human figures in a unique way. They are, at the one time, classical and abstract. It is almost as if his figures have chosen their relationship with their environment after an initial struggle to retain their integrity. “I attempt to bend the traditional attitudes of the figure, while still retaining my view of an aesthetic balance," he says. Born in Hammersmith in the UK, it was while studying Fine Arts at the Brighton College of Art that he realised he preferred the physicality and structure of sculpture to the discipline of painting. 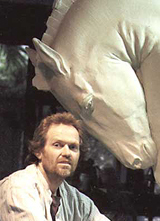 So began his journey with clay, developing the myriad of skills that are required to master sculpturing. He travelled for four years exhibiting his work and releasing limited edition art deco and art nouveau figurines and lamps, both in the UK and in Australia. In 1983 he became a permanent resident of Australia. For him, inspiration comes with a pose, an idea or a phrase and a context. In the beginning he develops his ideas on paper and experiments with the framework within which he can place his figures. He creates a scale drawing, from which he builds a clay original. By manipulating the figure in this way, he captures it in a blend of the real and the abstract. Once complete, a silicon rubber mould for the final piece is made, normally in bronze. “I'm observing the clay as it changes the human form. I am fascinated with muscles in the physique," he says. He draws inspiration from Greco-Roman ruins, art deco forms and contemporary abstracts. Stephen regurlarly exhibits and has public and private pieces in many countries including the USA, Australia and the Pacific Region.